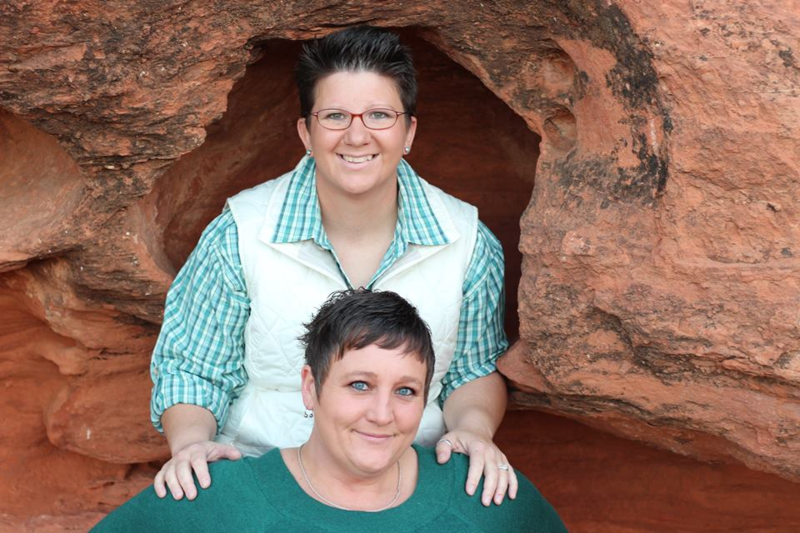 Community Coordinator Annalee Howland (bottom) with wife Tammy. Next up on our series of new faces at Epicenter is Community Coordinator Annalee Howland. Learn more about her story and what she’ll be doing with us in the interview below. Annalee: Green River has always been home to me. Even though I moved out of Green River at the ripe age of 6, my family had a business, several properties, and life long relationships here that have kept me connected. I’ve been planning my return to the area ever since the day we packed up and left; it took me 30 years but I finally got here. Never give up on your dreams! A: Previously I spent 10 years in St. George, UT working in healthcare administration where I managed assisted living facilities. I moved back to Eastern Utah and decided to change my path. I signed up to be an AmeriCorps VISTA and served the United Way of Eastern Utah for 2 service terms. After my service ended, I took a position at SEUALG as a VITA Program Director and the CDBG Coordinator. After moving back to Green River, I obtained my NREMT-Advanced and currently run as an Advanced EMT with Emery County EMS. A: I was excited to apply for the Housing Community Coordinator position at the Epicenter, because I feel I have the experience and skills to add to the organization to advance their goals and am looking forward to being part of this team! A: If I could have one superpower, I would love the gift of “shape-shifting”. The ability to literally be a fly on the wall, or to experience being a bird or a fish. Sounds kind of funny when I actually type that out, but…. it’s true. A: I spend my free time on our funny farm, where my wife Tammy and I have been working hard to restore my family’s ranch house on the river. We are going on two years of working towards completion, and while we have come a long way, there is still a lot to be done! We love to get out on the river whenever we can, but most days we are tending to our small unofficial animal rescue that has developed on our property. I am hoping someday to have some free time, but life is good! A: If I listed them all, it would be a very very long list because I can’t just pick one. BUT! I can tell you I have never seen ANY Star Wars movies, Harry Potter movies, or Lord of the Rings and I plan to keep it that way. In just a short time with us, Annalee has already taken charge of some big projects and we’re excited to see them take off!